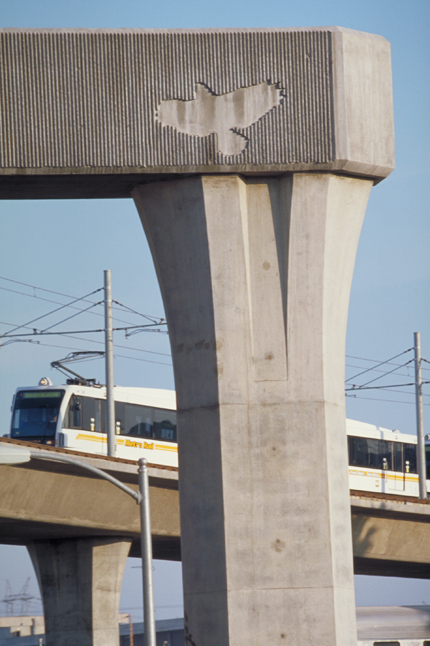 Throughout the 13.7 mile Metro Gold Line route, artist Beth Thielen has created iconic images of a red-tailed hawk, an antelope, mountains and arroyo, an oak tree, and a Gabrielino woman, and strategically embossed them into the concrete retaining walls, overpasses, and sound walls along the journey from Union Station to the Sierra Madre Villa Station. The images provide a symbolic narrative of history, nature, and movement along the line. The hawk evokes the notion of swift movement; the antelope, which used to roam in abundance in the area known as Los Angeles, is a symbol of the ever-changing landscape and the natural elements that have been lost; the mountains and arroyo suggest a permanence or sense of place-making; the oak tree, with its protected status in California, symbolizes nature’s sustainability and becomes a metaphor for our own commitment to the environment; and the Gabrielino woman refers to the story of the “Lone Woman of San Nicholas Island,” in which a Gabrielino woman remained on the Channel Island for 18 years after all her relatives were forcibly removed. Her image metaphorically reunites her to the landscape of her ancestors, and stands as a reminder to embrace the diversity among us all. 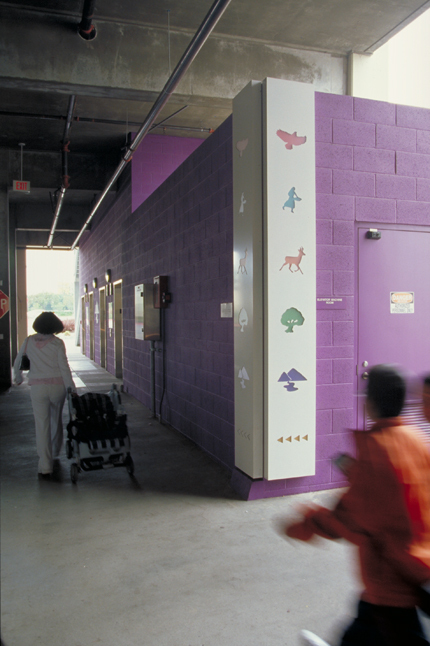 As one approaches the elevators at the Sierra Madre Villa Station parking structure, the images are reiterated in brightly colored mosaics on the pavement, and in colored plexiglass alongside the elevator enclosure. The repetition of these icons at the parking facility thematically ties together all the stations in a harmonic cadence from beginning to end, setting the tone for the rider’s visual experience.